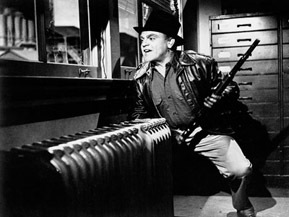 It's just a little ironic that James Cagney, the diminutive yet physically intimidating performer, made his name during the 1930s, 1940s, and 1950s mostly as a gangster in Warner Bros. films but won his first and only Academy Award for his role as an ultimate American patriot, George M. Cohan, in the 1942 classic Yankee Doodle Dandy. The award isn't just ironic because the role Cagney played in Yankee Doodle Dandy was so radically different from his more well-known roles, but because he's just as good, if not better, in his mobster roles. One of the most iconic images and quotes in film comes from one such feature, this week's classic movie: White Heat. Even if you haven't seen White Heat, you will remember the image and quote. Cagney, triumphant, arms raised, as he's about to be engulfed in flames, shouting, "Made it, Ma! Top of the world!" The image comes at the very end of White Heat and it's not really much of a plot spoiler for me to tell you that those flames do engulf Cagney's Cody Jarrett, a self-centered, childish, needy mobster whose last stand goes as well as George Custer's did. Jarrett is facing off with the cops and mentally unstable enough to set off a fire without figuring out what kind of exit strategy he should have. Jarrett is a fascinating character, and White Heat manages to bring a lot of action and typical gangster-movie tropes while also studying Cody's mental issues. The basics of the gangster-movie plot are always that, as cool as the gangsters may seem to us, they're always going down in the end. Sometimes it's flames, sometimes it's bullets, but there's always something around the corner. Of course, since the majority of the great gangster movies were made during the era of the Hayes Code (from 1933 to 1966), that means that there were never going to be happy endings for these criminals. The infamous production code was, if you can imagine, worse than anything the MPAA ever did. Yes, we can complain about when one movie is rated PG-13 despite being completely inappropriate for children, or vice versa, but at least the MPAA doesn't demand that filmmakers adhere to certain rules.